The DYNAMIXEL is a smart actuator system developed to be the exclusive connecting joints on a robot or mechanical structure. DYNAMIXELS’ are designed to be modular and daisy chained on any robot or mechanical design for powerful and flexible robotic movements. 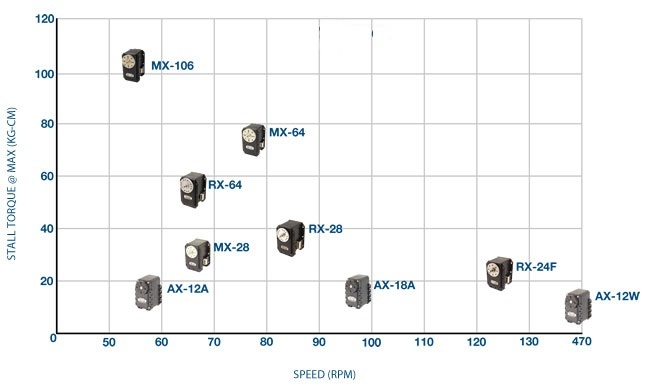 The DYNAMIXEL is a high performance actuator with a fully integrated DC (Direct Current) Motor + Reduction Gearhead + Controller + Driver + Network, all in one servo module actuator. Programmable and networkable, actuator status can be read and monitored through a data packet stream. Durability and quality is proven by world-class robot teams from over 30 countries. Please check out ROBOTIS' lineup of smart servos.